ORLANDO, Fla., April 3, 2019 — Wood may seem more at home in log cabins than modern architecture, but a specially treated type of timber could be tomorrow’s trendy building material. 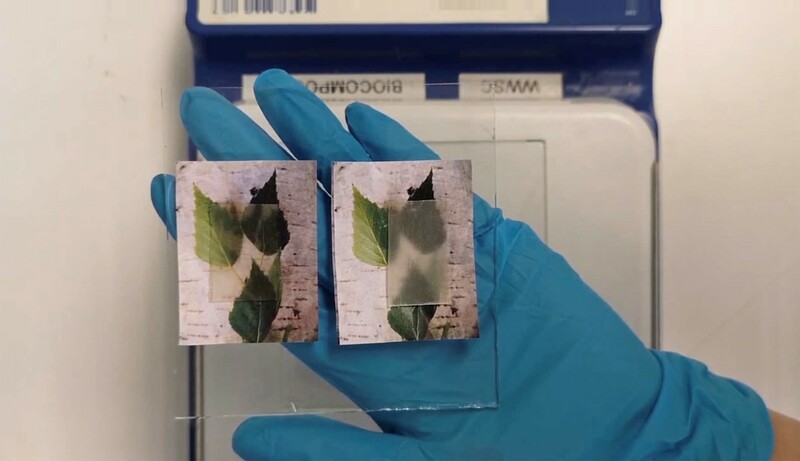 Today, scientists report a new kind of transparent wood that not only transmits light, but also absorbs and releases heat, potentially saving on energy costs. The material can bear heavy loads and is biodegradable, opening the door for its eventual use in eco-friendly homes and other buildings. As economic development progresses worldwide, energy consumption has soared. Much of this energy is used to light, heat and cool homes, offices and other buildings. Glass windows can transmit light, helping to brighten and heat homes, but they don’t store energy for use when the sun goes down. A new transparent wood becomes cloudier (right) upon the release of stored heat.